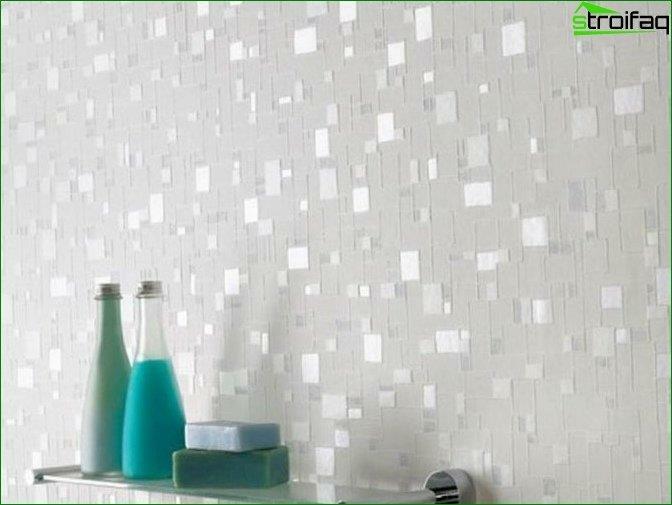 80 best ideas for interior decoration wallpaper for painting. The combination of colors, sticking and painting by hand. Probably everyone knows the feeling, when you wantchange the interior without much effort. 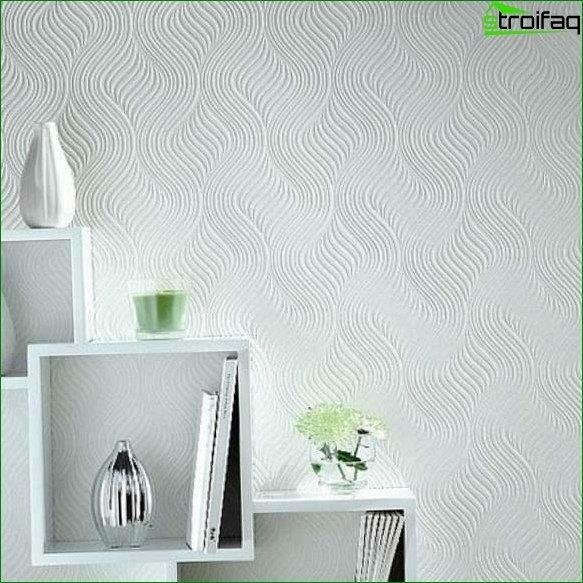 Or when you want to create a textured design of the wall, and the room sizes are not allowed to roam. What can help in this case? Wallpaper and paint! A great result of this combination you can appreciate in the photo below. 2.What paintable wallpaper is better to use? 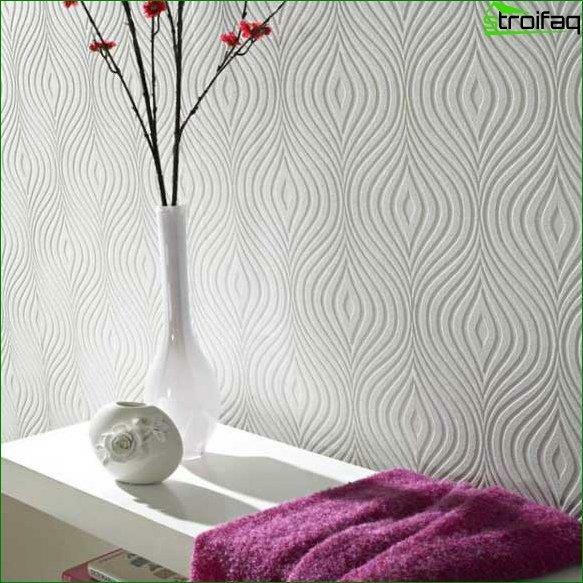 3.How to design the interior with the help of wallpaper with your own hands? 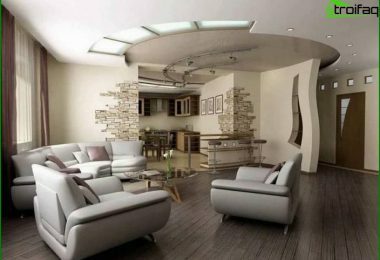 Modern manufacturers of finishing materialsThey offer a variety of options for decorating the walls - plaster, paint, wallpaper, liquid wallpaper, panels, etc. You can always pick up something that you have to not only taste, but also on the wallet. Painted wall - fashion trend of recent years. 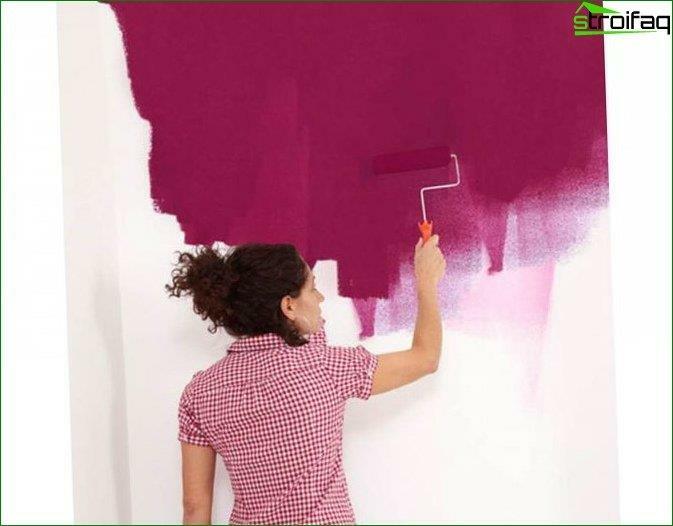 If you are using paint, you have the opportunity to paint your house in perfect shade (whether though color eared wheat in the rays of dawn, though the color of a stormy sky in July Barcelona - the main address of the directory or an experienced consultant coloring of and the choice of paint). 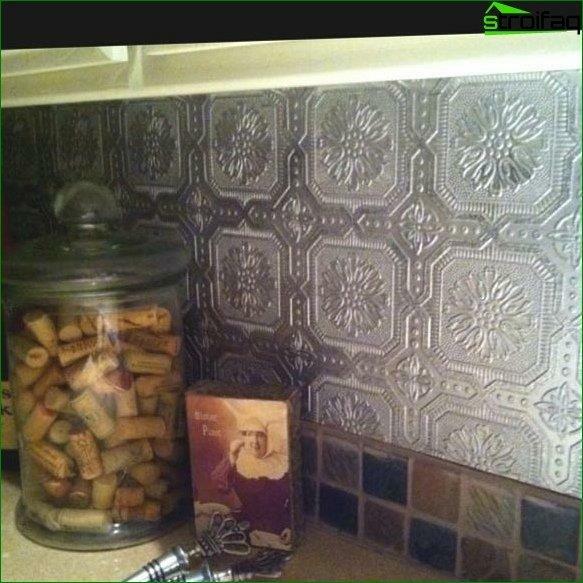 However, if you do not use a textured plaster, painted walls are just plain not interesting. 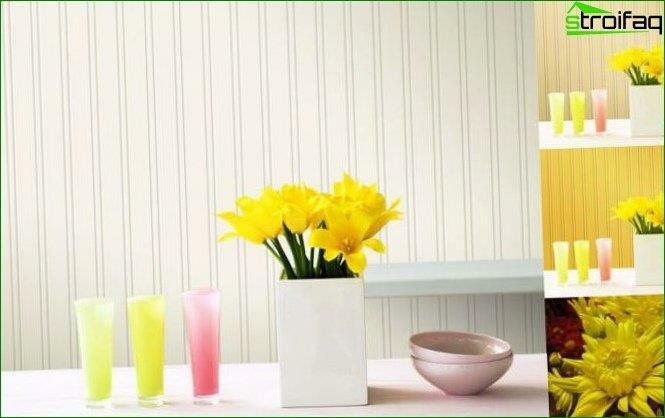 Besides, paint even minimally does not perform the function of heat and sound insulation. What to choose, if the advantages and disadvantages there and there and there? 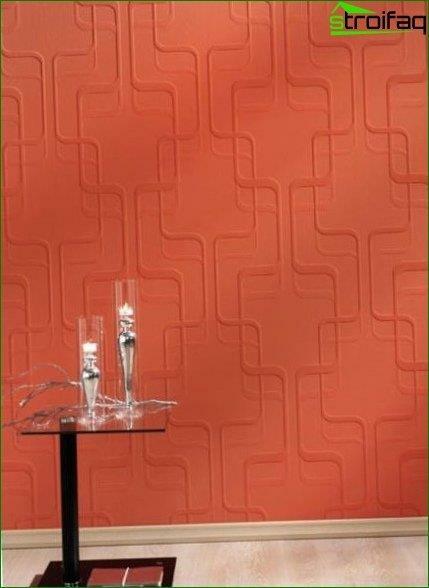 One of the ways out of this difficult task may be the choice of the special wallpaper for painting. Because of wallpaper for painting, you can change the color scheme in its housing up to 7 times! 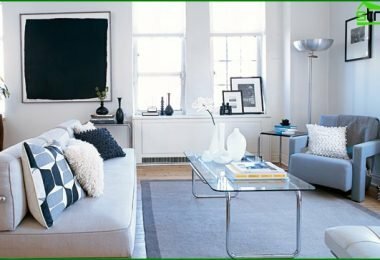 Apply a fresh coat of paint - and getupdated interior with little effort and cost. 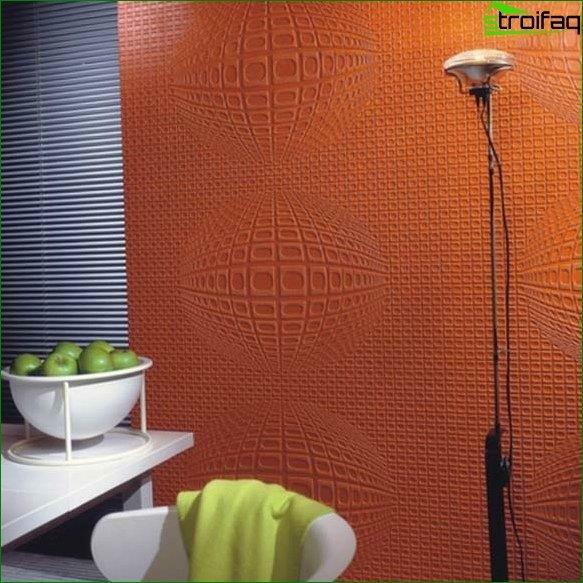 Walls will not be boring and "naked" at the expense of texture wallpaper. In addition, in order better to keep heat in the room. 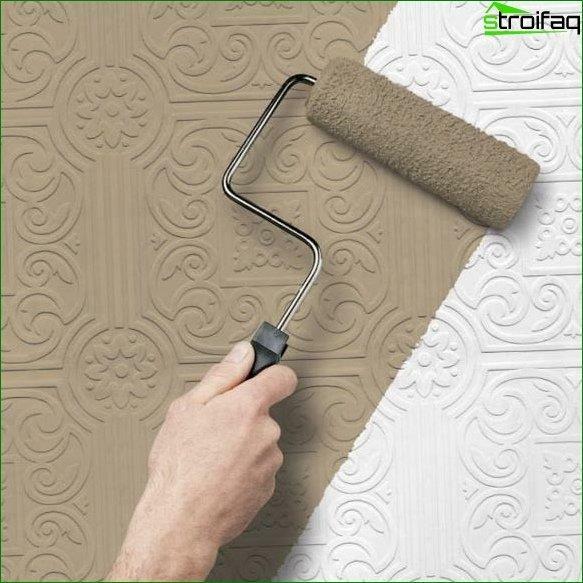 What paintable wallpaper is better to use? Not every wallpaper can be painted. 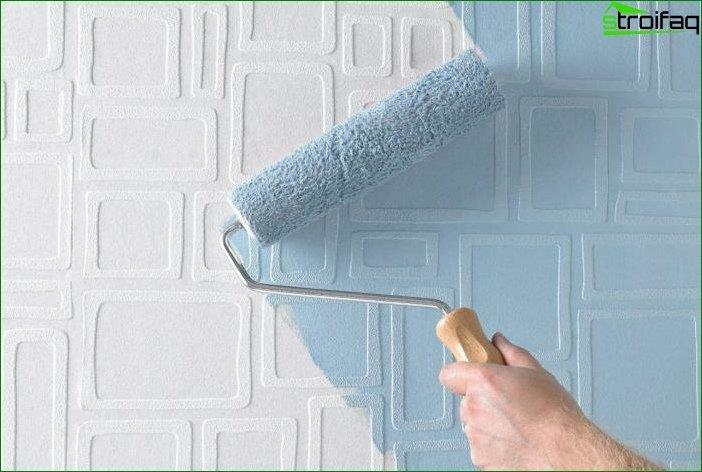 Ordinary wallpaper, when you try to apply to them the paint starts to bubble, peel off, limp. Therefore use only special. As a rule, they are white or light neutral shades. 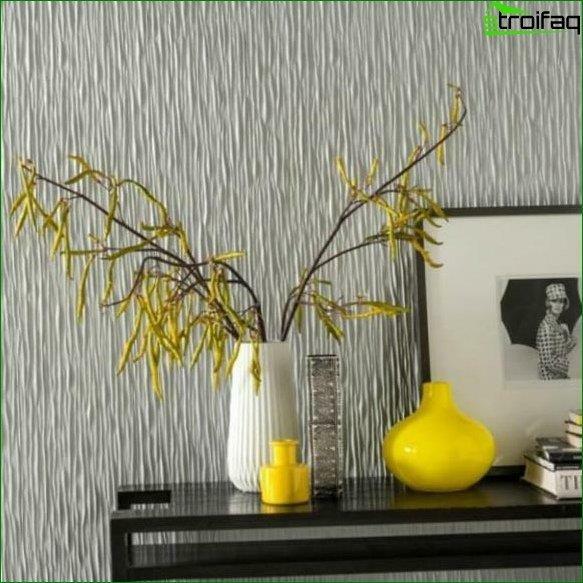 To produce these types of wallpaper usedfundamentally different materials and technologies, thereby producing different in properties and the feasibility of materials for wall decoration. That is why different types of wallpaper under painting so much different in density and cost per roll. Paper wallpaper - the first kind of wallpaper underpainting. They are easily glued, even on imperfect in terms of the smoothness of the surface. 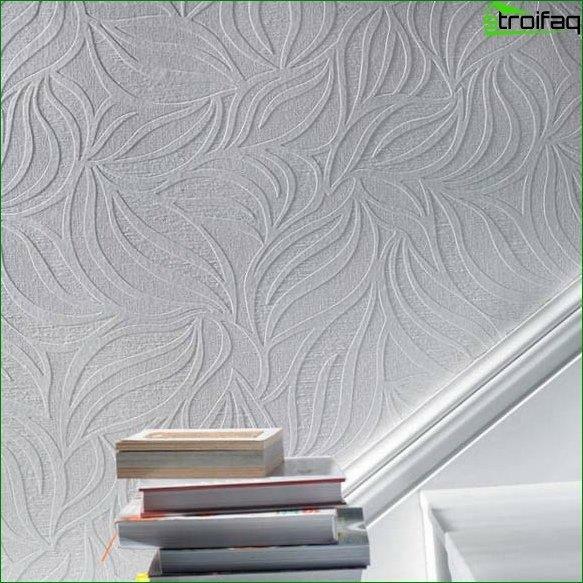 They usually consist of two layers, unlike ordinary paper wallpaper - more thick and strong. 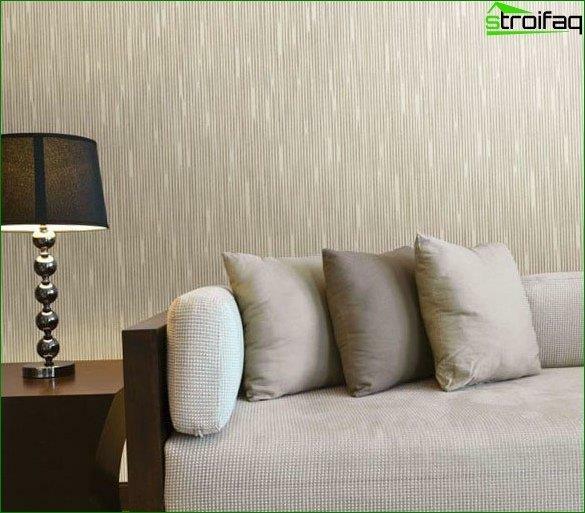 To wallpaper does not bubble and is not behind the walls during the first and subsequent paint layers, impregnated with a special moisture repellent agent. 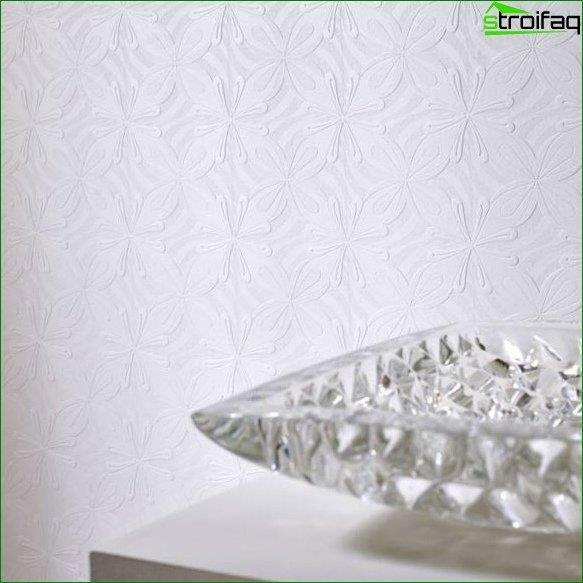 Using paper wallpaper for painting is not only convenient to decorate the walls and ceiling. Fleece, in contrast to the base paper for wallpaper,an order of magnitude denser and stronger. In addition, the undoubted dignity lies in the fact that it is not wrinkled. 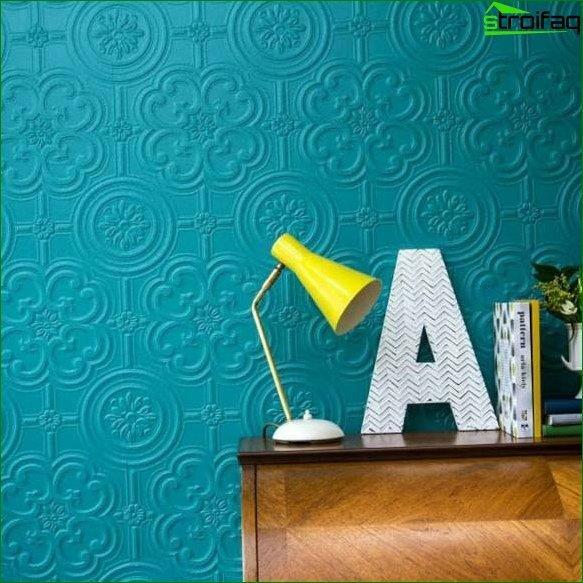 Using stencils to non-woven wallpaper is applied to the foam vinyl, so this coating for the walls is of particular vividness and variety of textures. 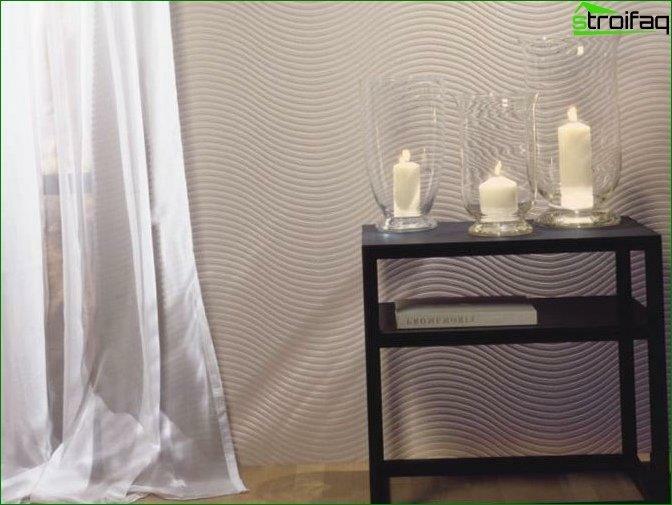 When choosing a non-woven wallpaper for paintingpay attention to the quality of the vinyl. 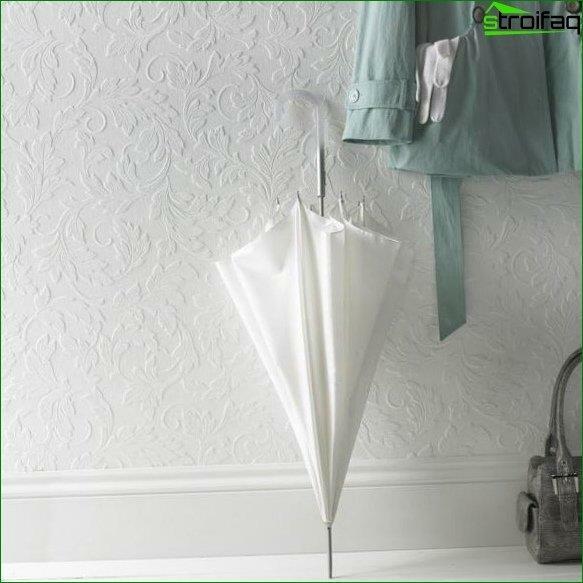 Vinyl spraying is very fragile and the lower the quality, the more likely it is scratched or depart during the gluing. 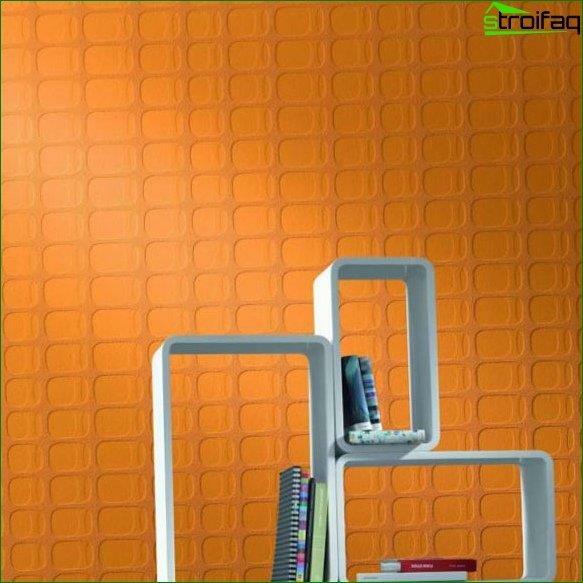 Therefore, when creating interiors in new buildingsExperts use them: because of the so-called "shrinkage of the walls" of new houses, they often appear cracks and irregularities, and non-woven wallpaper due to its structure will not only not break, but even help to contain the flaw and prevent it from spreading further. 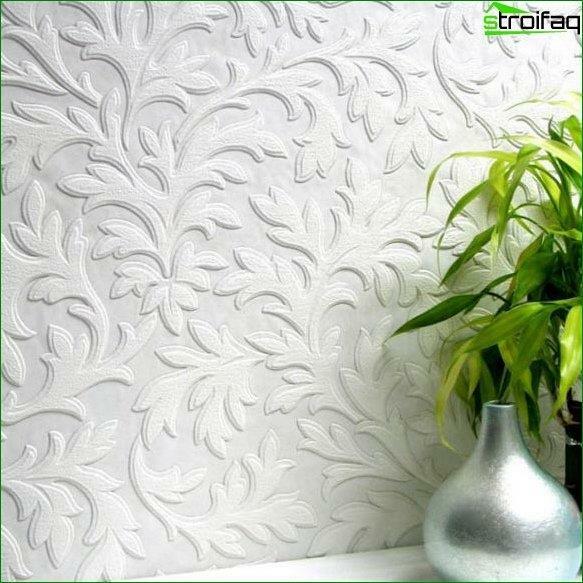 Unlike conventional non-woven wallpaper with vinyl-coated, non-woven wallpaper for painting, after applying to them the protective layer of paint, a lot less scratch. 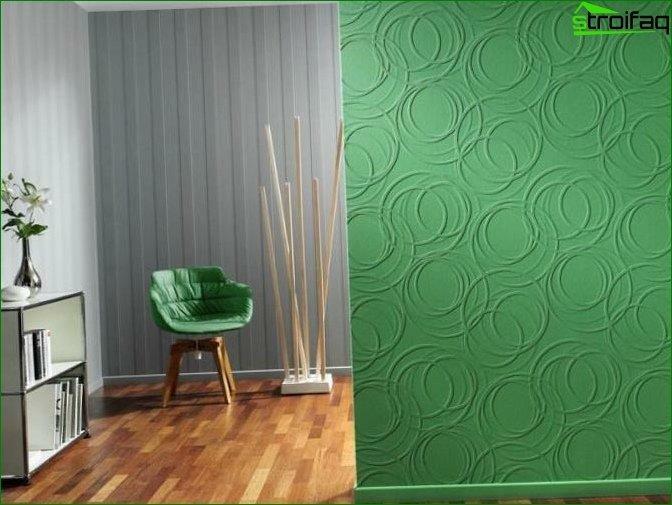 Fiberglass filament or glass as a basis for the wallpaper have been used relatively recently. They are mostly in demand in the production of photo wallpapers. Fiberglass yarns are made oflime, quartz sand, dolomite and soda, and then integrating them to the paper base. Such wall may have a different structure and a density (110 g / m2 to 265 g / m2). The yarns may weave in a variety of fancy patterns and reliefs among which the most popular diamonds, gossamer, herringbone and basket weave. 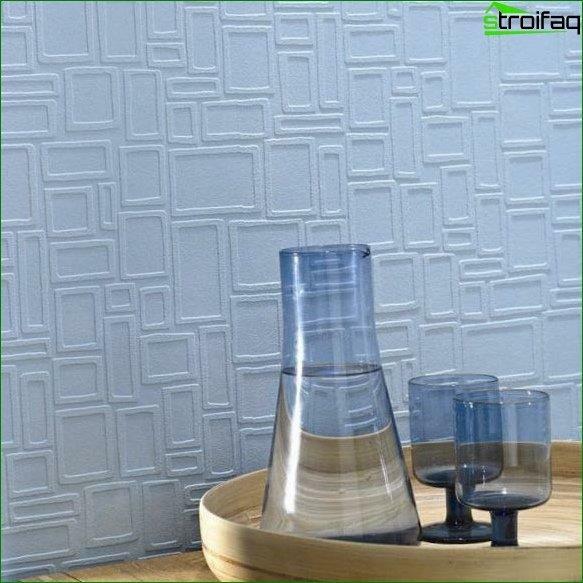 This type of wallpaper is incredibly strong and durable, so its price is fully justified. 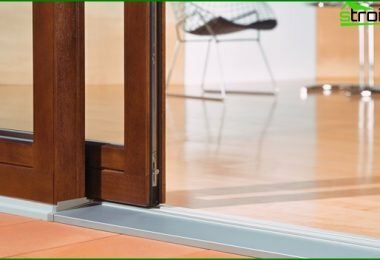 If you are afraid of the cost of the roll fiberglass for painting, think of how much money is in the interior of a room upgrade you will save in the long run. Even frequent washing with cleaning agents andbrushes, they are not afraid! 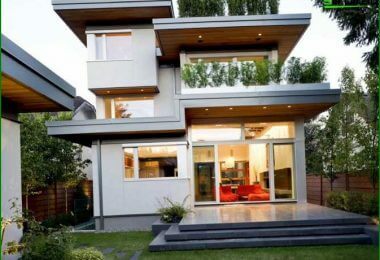 This is a great choice not only for residential but also for office. They are fairly easy to glueing, however, have the right to stick the first time: to tear fiberglass from the wall - not an easy task. 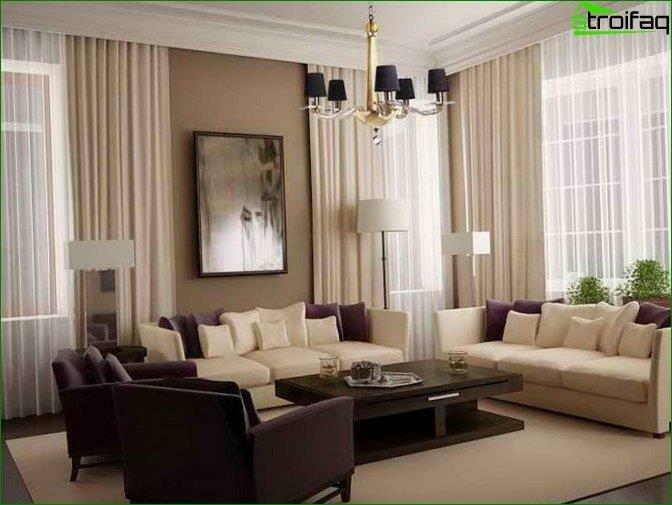 How to design the interior with the help of wallpaper with your own hands? There is nothing in the world that could not beto make their own hands. 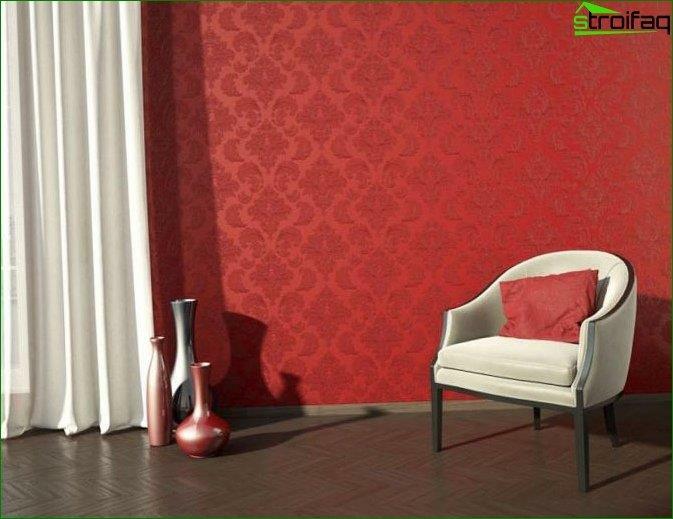 This also applies to self-design of the room with the help of wallpaper for painting. Moreover, that self-sticking wallpaper for painting has a very significant plus: repair team, working with the wallpaper for painting, taking double payment - separately for gluing and separately for staining. Wallpaper for painting are glued the same way as usual. As wallpaper glue right - look at the video below. 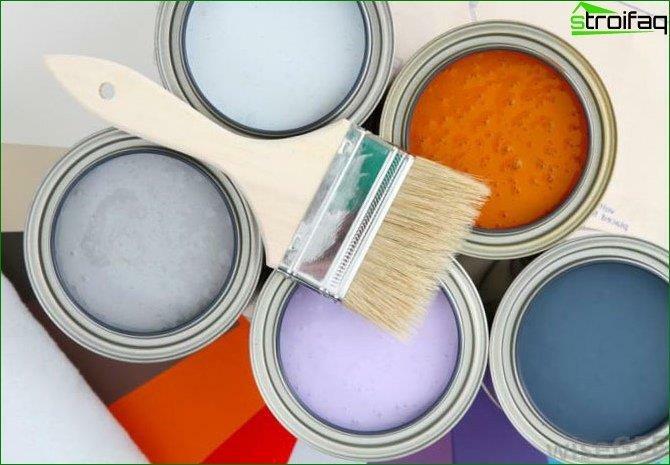 For painting you will need: a roller, a ditch (or any container in which is placed a roller), brush, masking tape, capacity for dilution of paints and polyethylene (to protect furniture and other items). Choosing paint - remember that for each type ofit has its own wallpaper. 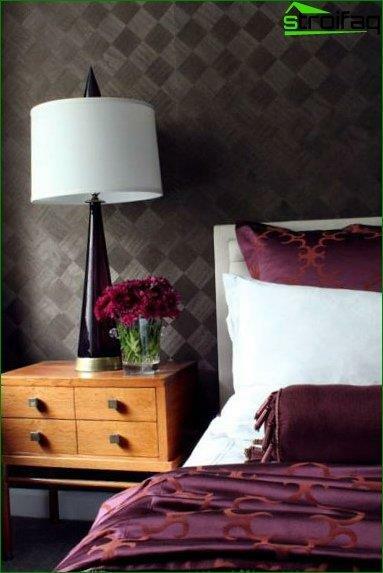 Paper wallpaper and wallpaper on non-woven basis is better to paint with latex paint. 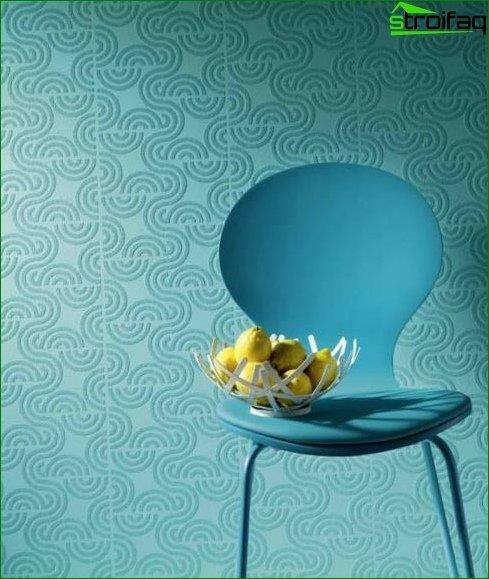 For wallpaper based steklovolkna suitable acrylic or latex paint. 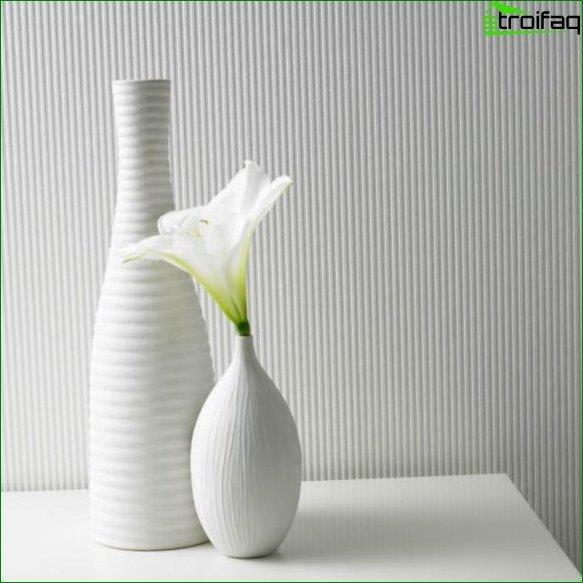 The need to wash the wallpaper in the future need to think about it at the stage of selection of paint. The first time you need to paint the wallpaper twice with an interval of at least 60 minutes. 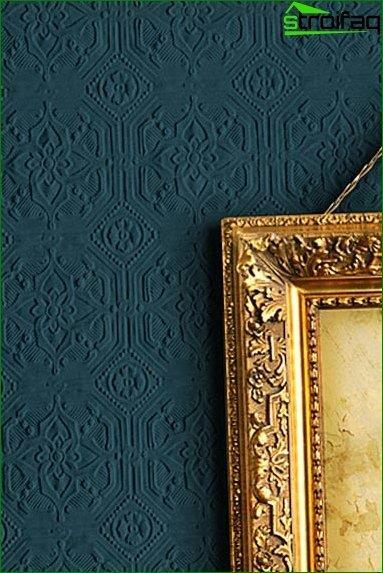 The more experienced your wallpaper paint layers, the less they will be visible texture. If you combine two or more colors, the colors border Make out with a brush. The optimum temperature for painting - from 17 to 22 degrees Celsius. 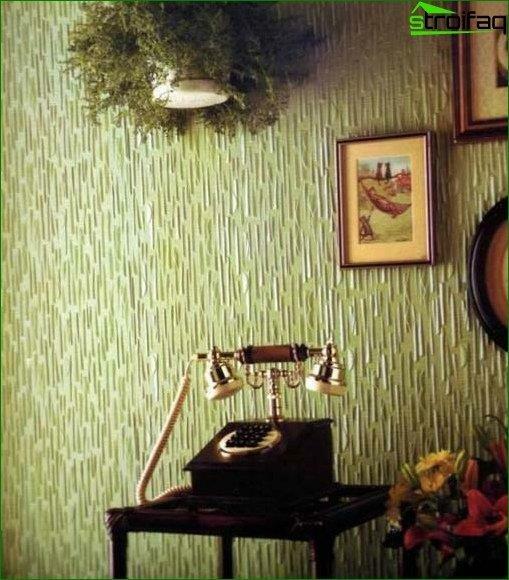 More advice on how to paint wallpaper - below. express his creative nature, tending to be creative. Agree, it is much harder to do with the factory wallpaper. 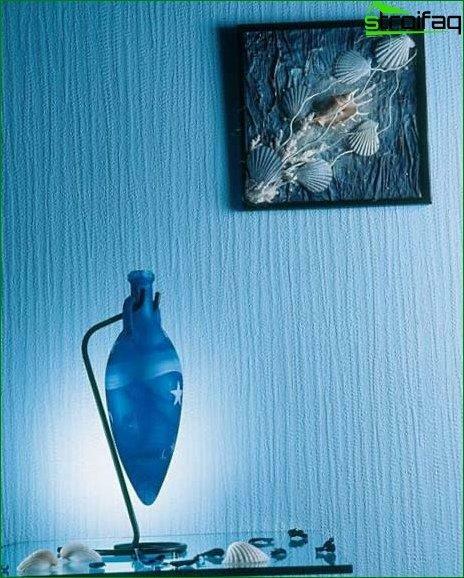 The main answer to the question "How to paint the walls inseveral colors "- carefully! Even the most fantastic drawing made "like a chicken paw" is not only impress, but also repel all located in your room. Also, there are some important nuances in painting the walls in two colors (three or more). Combining related shades: blue and mint, beige and gray, etc. Combining the gradient, that is a combination of tone color, different in its density. The combination of different and opposite colors: red, green, blue, orange, yellow, purple, etc. When choosing a contrasting color expertsrecommends to focus on their temperature, saturation, "sound" - they must be similar. 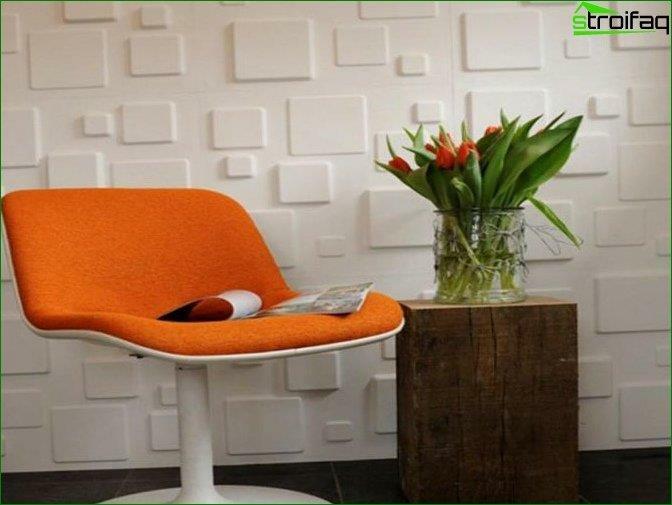 For example, orange orange is best combined with a dark green, peach and orange - with olive green. If you do not have a talent colorist not combine more than two colors on their own. 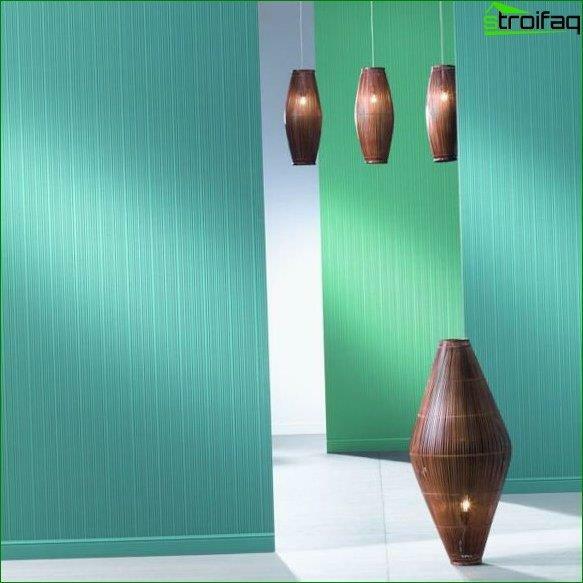 The surest rule when choosing combinable colors: Choose the color, the combination of which is found in nature! Second, think in advance how it will take shape connection colors. To create a smooth boundaries using paintScotch. If for some reason you can not buy it, the joints may well be issued with a paper border, wooden slats, mosaics, moldings, etc. of poleuritana For these purposes is fine reliable adhesive or liquid nails. If the colors are united projecting corner - set it to the aluminum profile. This not only makes a neat seam, but prevent destruction of angle further. Third, be sure to buy the paint with a stock! If you yourself create the desired hue by pigment - do it with a large supply of paint, because if the paint finish, to achieve identical color for the second time is almost impossible. There just does not exist painting techniques wall two colors! The most simple and the most occurring - divisioncolors horizontally (that is, when one color is positioned above the other). Traditionally, the walls are painted in such a way that the lower tone took about one-third the height of the wall, and the top - two or three. That being said, a classic. 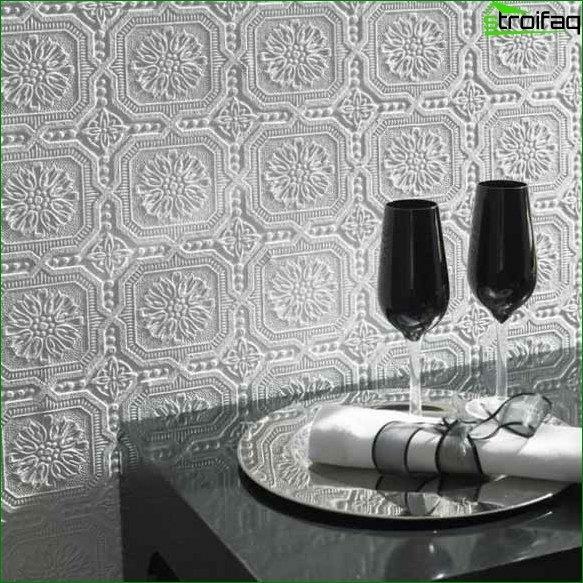 In addition, the decoration is very similar to the lower part of the walls using panels. However, you are not forced to follow it and you may well express their imagination, having tsvetorazdela line in the middle, the upper part of the wall (bottom color - 2/3 of the wall and the top color - 1/3 of the walls), or almost to the ceiling. This painting would be appropriate to look at children, or cutting-edge interiors. Along with horizontal tsvetorazdelom you canuse the vertical. How to assign a border - it's up to you. You can select the color of one wall, and you can, alternating colors, select multiple functional areas. In this case it is better to use a light, bright, neutral color, and one or more saturated bright. Using gradient coloring functional areas borders will be softer. 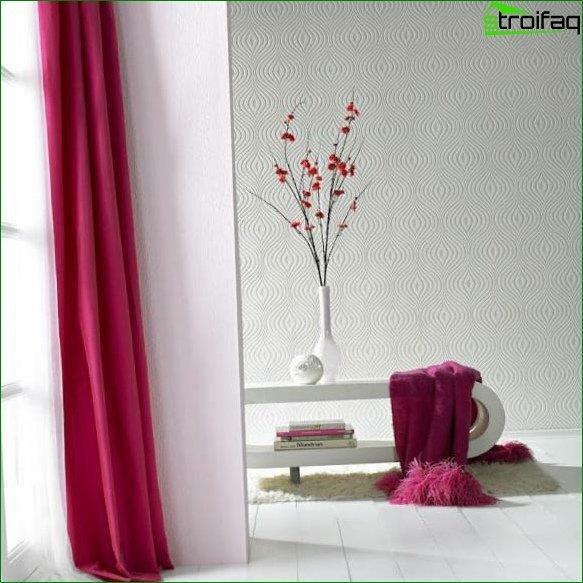 You can paint every wall in a single tone of the same color - it will also be considered as a gradient. This painting would be appropriate, for example, in the bedroom. If your design requires a wall nichesor projections, you can easily identify them and to stress by means of color. 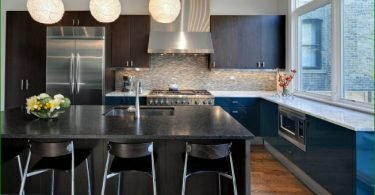 Accents can be done using color 2-4 shades lighter or darker than the base. You can also "draw" on the wall panel. It's enough to stick to the already painted the base color of the wall masking tape so that turned inside squares, rectangles or circles - it all depends entirely on your imagination! 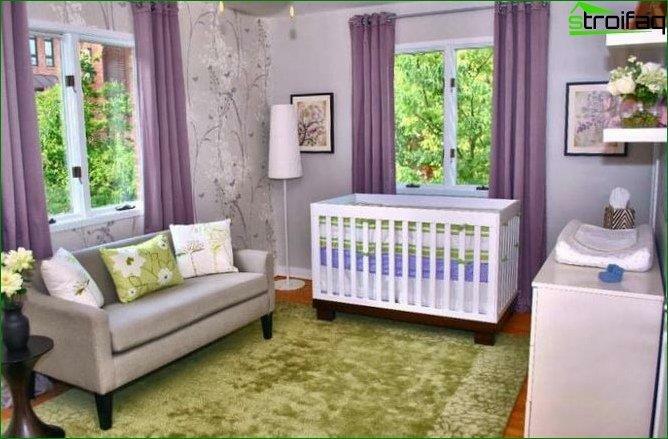 It is interesting to look at the interior paintingstrips. This may be one horizontal strip across the room, or a plurality of narrow vertical strips. Work laborious, but the effect - stunning! The wider the band - the less trouble with applying an adhesive tape! Well, if you are so very creative person, you candecorate your walls with the help of figure staining. Curly can manifest in unexpected ways - from the design of borders or colors wave zigzag, before applying to the wall of colored peas, diamonds or even a full-fledged drawing in graffiti style. 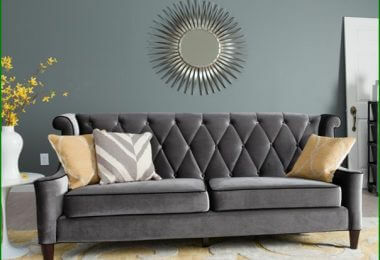 Doing repairs in the living roomYou can follow the fashion trends andfashion trends. This room is not just the heart of your home, it is his face, on which will evaluate and take and you at that number. 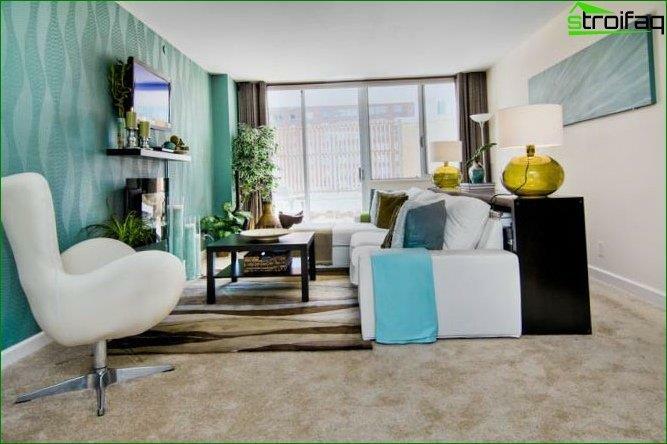 However, in the pursuit of the trend, do not forget that your guests should be pleased to be in the room. 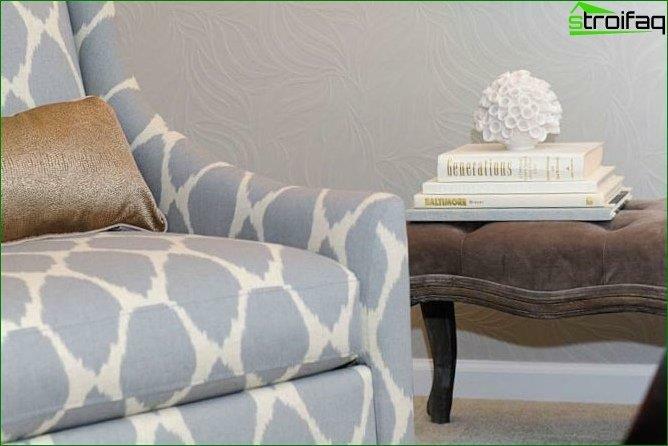 For more information about choosing a wallpaper for the living room read here. In contrast to the living room, bedroom It must correspond exclusively to your tastesand needs. This room should not be subject to interest strangers. Bedroom - a place of relaxation, so when painting wallpaper for painting is better to choose calmer, pastel shades and emphasis, for example, stressing niche or drawing panel with bright colors. Children's room - a real paradise for the riot of imagination! It is here that is supposed to apply the most incredible shape, color, painting technique, because children have to be interesting! Wallpaper for painting - perfect for children's roomBecause even when a child will age"Drawing on the wallpaper," is not a problem - you can always repaint the wallpaper, instead of a long and tedious glue them. Moreover, there are even special wallpaper-rasskraska, with fine images of cartoon characters, which are not only possible, but also need to decorate. Or you can just leave one wall of white, to her it was possible to draw. Believe me, your child will be satisfied! Do not forget that the walls in the nursery is likely to have to occasionally wash, so choose the paint intended for washing. 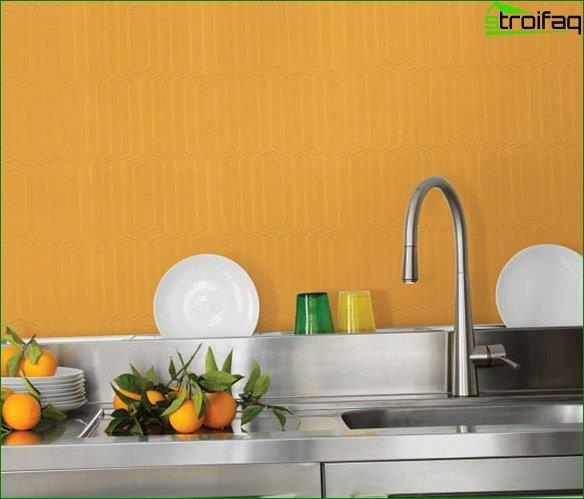 Wallpapers for kitchens should be as strong, moisture- and heat-resistant and designed for washing. Therefore, the ideal option - fiberglass. Although in the hallway the walls are exposed to a smallerImpact, than in the kitchen, but the street on shoes and clothes is filled with a lot of dirt and settles it, above all, it is on the walls of the corridor. Therefore, it is also desirable to wash them periodically. In addition, if you have a small child and you often walk with a stroller, the wallpaper should be strong enough not to get spoiled by accidental hooks. 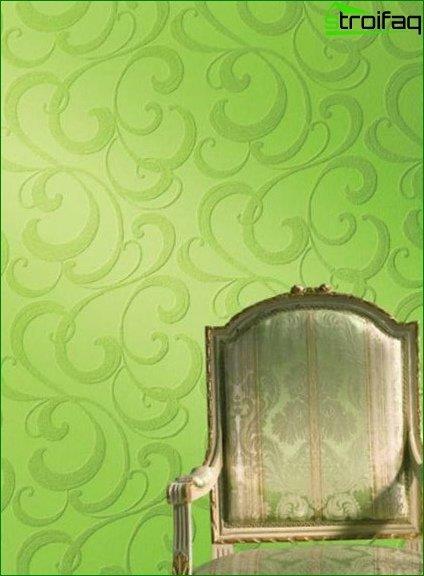 If you are still unsure whether will look good wallpaper for painting in the interior - look at the photo below.